LA PALAZZETTA is a Villa of the 16th. century with a farm and ancient cottages of the 18th. century. The complex is called a "Borgo" as it used to be a proper village with farmers, surrounded by 100 hectares of blooming woods and green olive fields. The Villa is only 5 minutes away from TODI near the major art centres of the Umbrian region, and offers an extraordinary view over the Tevere River Valley from its hilltop location. 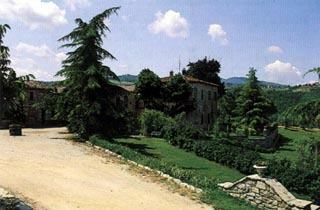 The Villa is in the heart of the "Borgo" and preserves frescoes of 1920 painted by Giacomo Balla and Gerardo Dottori. It is the home of Count Ensoli Caracciolo and has a private garden in italian style with fountains, high hedges and trees. 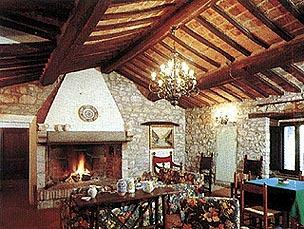 The interior is furnished with carpets, furniture and paintings which are all precious antiques of the owner's family. LA PALAZZETTA's unspoilt rustic atmosphere is ideal for relaxation. Each room has private bathroom, telephone, color TV, and central heating. 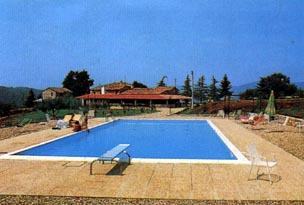 The main Villa, with its frescoes by Balla and Dottori, offers the more discriminating guest 2 suites. The other 12 rooms in the ancient cottages are also elegantly furnished. They each have an independent entrance, ptivate bathroom, colour TV, direct telephone and hair dryers. The beautiful restaurant in the "Borgo" LA PALAZZETTA offers half board with Umbrian and mediterranean cuisine using natural products of the farm itself. The complex also has a meeting room, children's play ground, regular bowling-green and a wonderful swimming pool with a sun terrace. Airports PERUGIA 35 km. ROMA FCO 120 km. Railway Stations PERUGIA 40 km. FIRENZE 190 km. Highway Exits ORVIETO 25 km. ORTE 45 km.